The author is a long time fly fishing guide and a fly fishing instructor which gives him an insight that is very helpful to any angler that desires to improve their fly fishing skills. 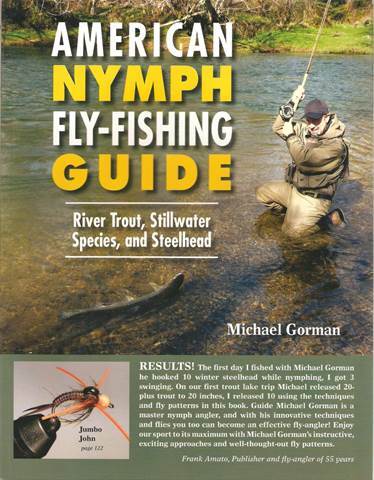 The book covers all aspects of nymph fishing from stillwaters to running water. There are sections that cover equipment, insects, and fly patterns. There are no tying instructions but the formula for the patterns that are listed can easily be obtained. I think that the following quote from the book gives the mindset of the author concerning nymph fishing. "M. Scott Peck, in his classic work The Road Less Traveled, maintains that what we all share as humans is a tendency towards laziness. As this applies to nymph fishing, there are many little details that need to be attended at any time – leader length, indicator adjustments, fly changes, and constantly monitoring the correct amount of weight for an effective drift of the nymphs. …………It is not a game for those with chronic inertia or inclined to laziness." The book is lavishly illustrated with color images throughout. If you are truly interested in becoming a nymph fly fisher or becoming a better nymph fisher this book has much to offer.